Queen Anne architecture arose in England in the 1870s and is part of what is called the Domestic Revival movement. Its origins are attributed to a reaction against High Victorian and French styles, and to a prevailing sense of nationalism. In Queen Anne architecture, the English were attempting to express a rejection of industrialism and to show an affinity with nature, or at least a more organic, less rigid sense of structure. Queen Anne architects combined elements from earlier periods from Tudor to the reign of Queen Anne (1702-14) in an eclectic manner. 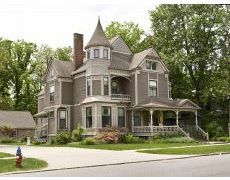 Exterior Queen Anne style is characterized by double hung, high, narrow windows with small panes and white painted trim. Other defining exterior features are bay windows, tile-hung gables, and large porches. Interiors of Queen Anne style homes and public buildings feature informal and spacious rooms in asymmetrical arrangement with an emphasis on comfort. 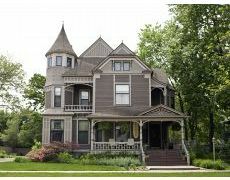 The Queen Anne style died out in England by the end of the 1880s but was very popular in the U.S., including San Francisco and Seattle where many fine examples of Queen Anne Victorians can still be seen. It inspired the Shingle Style, which became popular in the U.S. in the 1880s.